Citation Information: J Clin Invest. 2005;115(12):3332-3338. https://doi.org/10.1172/JCI26720. Platelets, derived from megakaryocytes, have an essential role in thrombosis and hemostasis. Over the past 10 years, a great deal of new information has been obtained concerning the various aspects of hematopoiesis necessary to maintain a steady-state platelet level to support physiologic hemostasis. Here we discuss the differentiation of HSCs into megakaryocytes, with emphasis on the key cytokine signaling pathways and hematopoietic transcription factors. Recent insight into these processes elucidates the molecular bases of numerous acquired and inherited hematologic disorders. It is anticipated that the growing knowledge in these areas may be exploited for new therapeutic strategies to modulate both platelet numbers and their thrombogenicity. Megakaryopoiesis pathways. 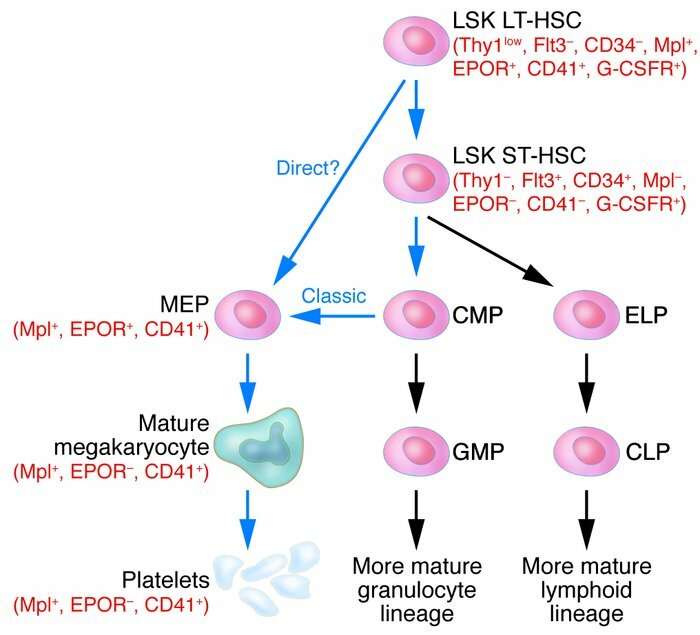 The figure extends from the HSC to platelets and offers a combination of the more “classical” pathway, leading to the common megakaryocyte-erythroid progenitor (MEP), and a proposed “direct” route from the HSC. Pathways leading to platelet production are indicated by blue arrows and other pathways by gray arrows. Surface markers of importance are noted in parentheses in red. LT-HSC, long-term HSC; ST-HSC, short-term HSC; Thy1, thymus 1 (“low” indicates low surface antigen and “–” indicates none detectable); Flt3, FMS-like tyrosine kinase 3; EPOR, erythropoietin receptor; CD41, glycoprotein IIb/IIIa or αIIbβ3 integrin receptor; G-CSFR, G-CSF receptor; CMP, common myeloid progenitor; ELP, early lymphoid progenitor; GMP, granulocyte/monocyte progenitor; CLP, common lymphoid progenitor.